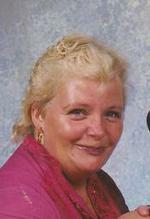 Becky Bikar age 62, of Ashland, died Thursday April 28, 2011 at her residence. She was born in Ashland on September 25, 1948, the daughter of the late Amos David and Olive Emma (Ritz) Mumaw. She was a graduate of Ashland High School in 1966. Mrs. Bikar had been employed with Swan Cleaners in Mansfield and previously been employed at Myers Cleaners in Ashland. She was a member of the Third Street Brethren Church and the Daughter's of Ivory Mountain. On May 5, 2000 Becky married Robert Joseph Bikar Sr. who survives. Also surviving are her daughter and son in-law, Diana Louise and Scott Dennison of Ashland; her sons and daughters in- law, James and Melissa Myers Jr. of Wooster, Kevin and Beth Myers of Hayesville, Robert and Kim Bikar Jr. of Texas; 12 grandchildren; 3 great grandchildren; brother and sister in- law, Richard and Linda Mumaw of Mifflin; along with her sisters and brothers in-law, Diana and James Greenawald of Michigan, Amy and Dean Blair of Shreve, and Candace Findley of Medina. Mrs. Bikar was preceded in death by her parents, sister Peggy Amend and brother David Mumaw. The family will receive friends at the Garber Brethren Church 163 Sherman Ave., Ashland on Friday April 29, 2011 at 3:00 P.M. Heyl Funeral Home assisted the family with arrangements. The family suggests memorial contributions may be made to Hospice of North Central Ohio 1050 Dauch Dr., Ashland, Ohio 44805 or to the Ashland County Cancer Assoc., 380 E. 4th St. Ashland, Ohio 44805.